On January 31, 1969, Meher Baba dropped his physical body. We have recently passed the fiftieth anniversary of that event occurring. There are two significant Avataric responsibilities that were to be set in motion based on Baba leaving our physical presence. 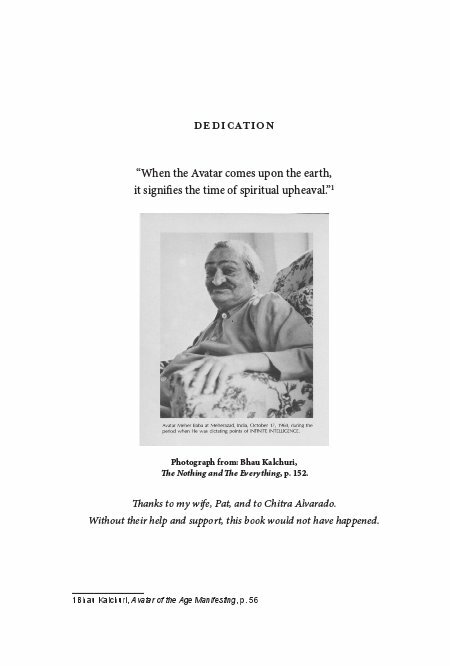 First, while still living, Meher Baba was to 'break his silence'. He had begun his silence on July 10,1925 and he continued in that silence for the remainder of his life. He made the promise that he would break his silence before he left us. Did he break that promise to us or did he actually break his silence while still living? The second responsibility is related to his Manifestation. With the dropping of his body, it was to set in motion his Manifestation. What does that mean and is it actually happening now? 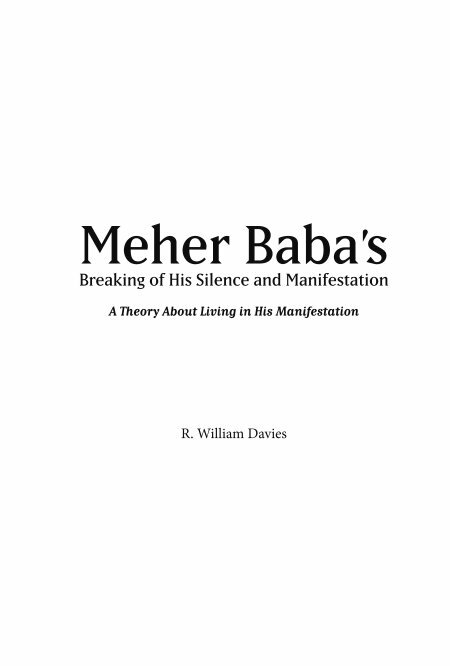 This book develops a theory that says yes, Meher Baba did break his silence. This theory also provides a possible date for when it did occur and provides insight into what this means for us living today. 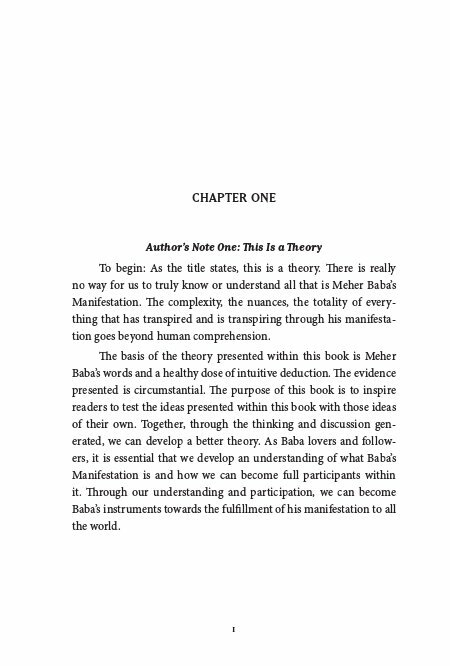 The book also presents a theory related to Meher Baba's Manifestation and how that also is impacting upon our daily lives as we continue to live through his full Manifestation. I became a Meher Baba follower and lover in the early 1970's. I had been on a spiritual quest all through my college years and into my early adulthood. I was born and raised as a Christian and the basis of my faith was built on Christ's and God's love for each and every one of us. My spiritual search was not in the rejection of my Christian upbringing; but it was in what my beliefs were in and of themselves, they were incomplete. Something was missing. When I found Meher Baba, everything became full and complete. For me, it was never a rejection of one for the other, but a completeness within both. In Baba's truth, I found Baba in Christ and Christ in Baba and in their union as One, I found my peace. This gave me the spiritual anchor that I needed to live my life. In the living of this life, I have not talked about this with anyone; not family, friend or anyone. This is my confessional to you, the reader. One of the things that I discovered about life, however, is that the spiritual quests never ends. My life has become one continuous spiritual search after the other. Questions arise and I attempt to seek out their answer. This is my second book. 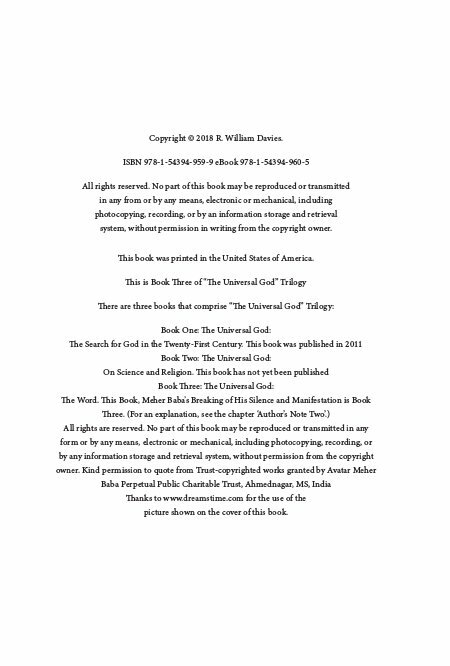 My first book is titled: "The Universal God, The Search for God in the Twenty-First Century". 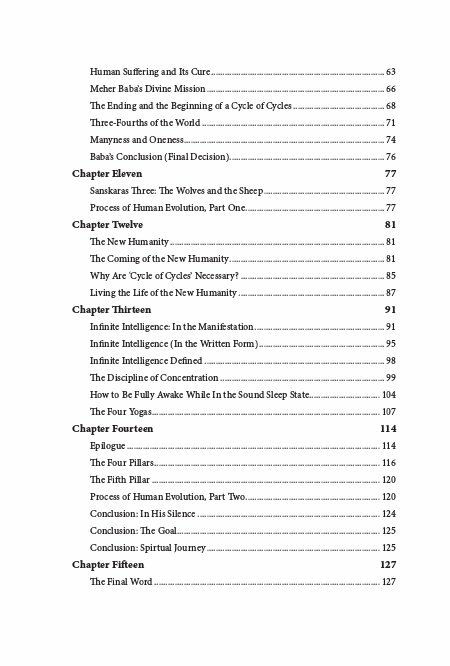 It is a comparative religion book and that book came to be as a spiritual quest to both understand each of the great modern religions in a positive manner and to also search within them for truths that are universal and commonly shared by each of them. Most comparative religious discussions emphasize their differences. 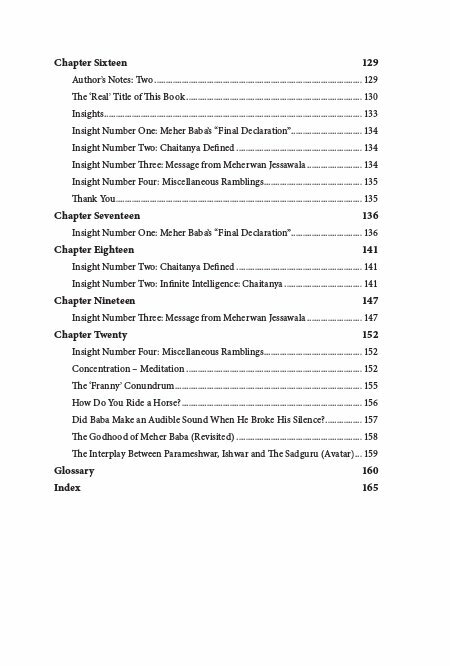 Within this book the emphasis is on those beliefs that are commonly shared. This new book also came to be through spiritual curiosity. 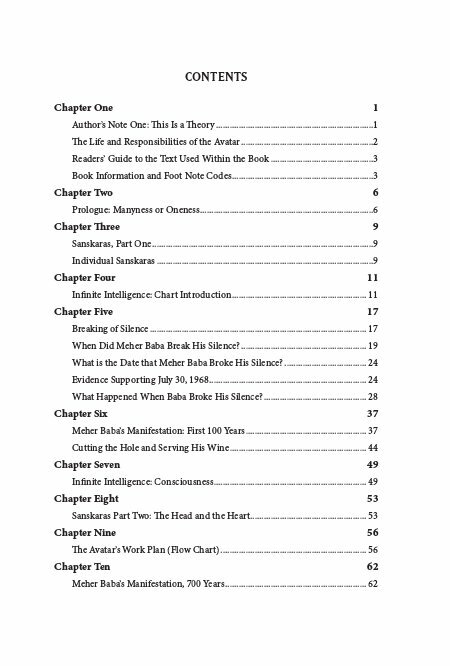 Questions arose within me related to Meher Baba's breaking of his silence and manifestation. We are now living fifty years into his manifestation. 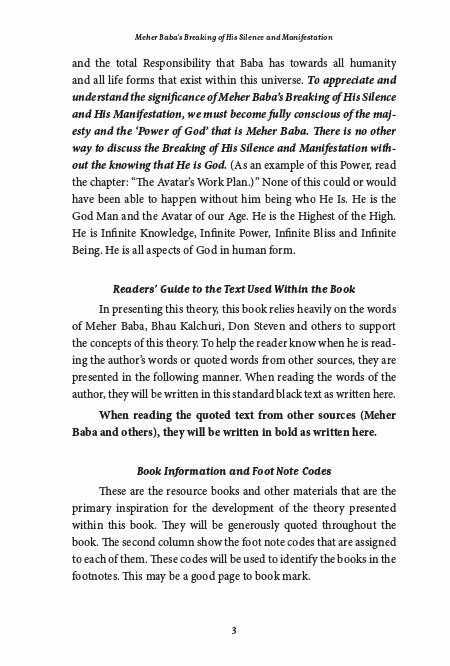 To me, these are the two most essential events in understanding Meher Baba's full Advent. As Baba followers, we currently can only look backwards to remember who he was. Until we address and understand the 'breaking of his silence and manifestation', we can't look forward. Baba's fulfillment of the 'breaking of his silence and manifestation' hold the key for all of us to know where we are going. The fulfillment of those two events sets in motion both our futures; as Baba lovers, as well as the future of all humanity.